I can’t give you a picture of my entire TBR stack; most of it has been packed. But, here are the most urgent of the bunch, the ones I couldn’t bear to pack yet, reasoning: I still have to have something to read between now and when we move. I plucked one from its number yesterday. Here’s to a few more! What books call to you? I’ve always intended to read something by Willa Cather, but just haven’t managed to get around to her yet. Maybe this year. And after looking at your photo, I’ve just got a couple more books to add to my own list! I’ve only read a couple of those, The Girl with the Dragon Tattoo and the Spellman files. I really enjoyed both. My TBR pile is to spread out to take a picture of, at least some of them are hidden from view in a cupboard, though. 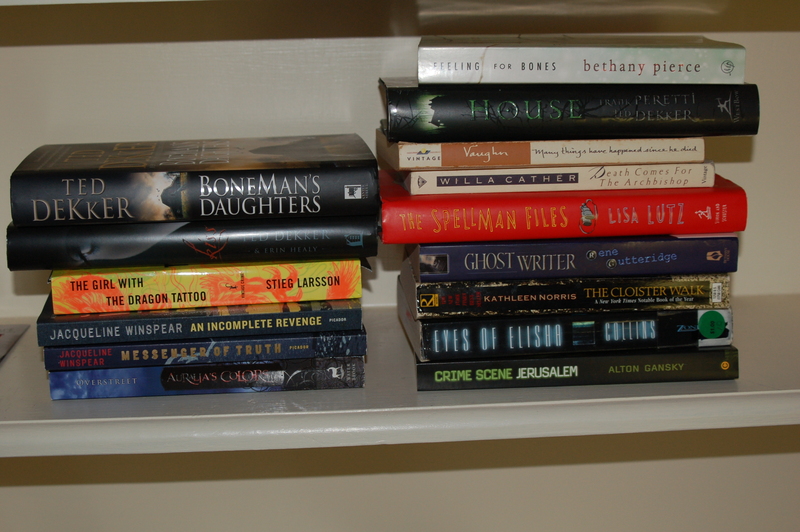 I probably cannot fit my tbr stack in a photo with any clarity. The Girl with the Dragon Tattoo is still in my pile too. The Jacqueline Winspear books and the Willa Cather will be real treats for you I think. I would start there I think. Happy reading! Willa Cather is on my wish list! I am not moving for another couple of months, but I really like having an “urgent TBR” stack. It gives me a little organization and makes it easier to choose from my masses of unread books. Everyone has been praising The Girl with the Dragon Tattoo, so if I were you I’d go for that first! I see some good books in those photos! I have so many that I can’t even think about them. I did enjoy Boneman’s Daughter, though. Ooh, I want to read Girl With The Dragon Tattoo as well as Ghost Writer. I see Boneman’s Daughter on your shelf. I’m about 1/2 way through the audio version right now. It’s pretty good.